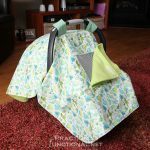 AJ has been so interested in toys with texture lately, I figured it was the perfect time to introduce a tag toy! I’ve seen a bunch of cute tag blankets while browsing through Pinterest, but I wanted something smaller and easier for her to grab. Plus she already has a billion blankets! 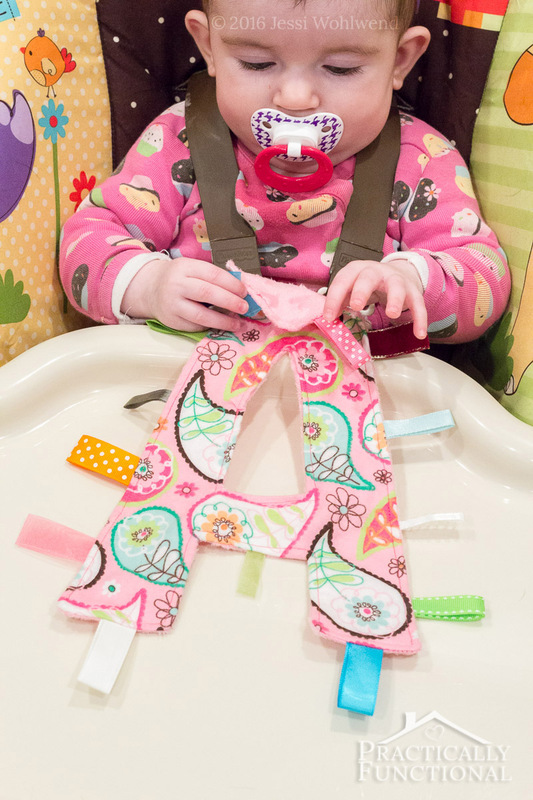 So I decided to make a monogram tag toy with fun ribbon tags and a crinkly interior, and she just LOVES it! 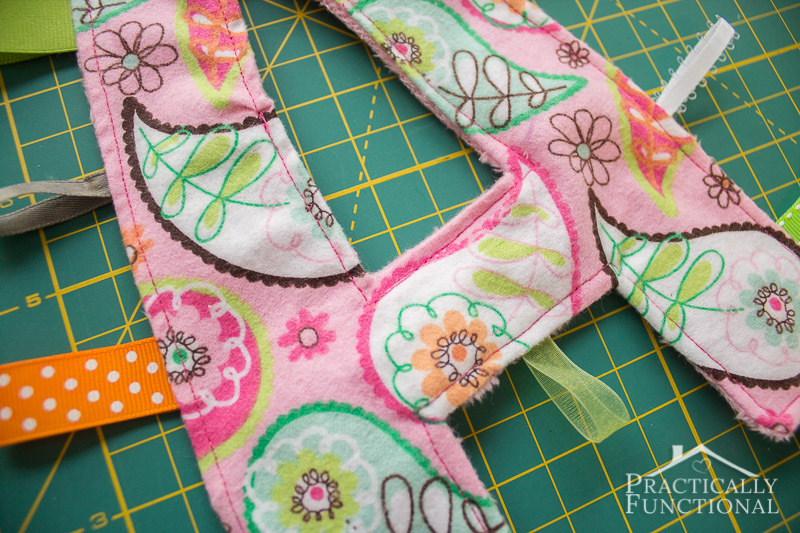 This cute monogram tag toy is such a fun and simple sewing project; plus you can personalize the monogram, so it makes a great baby shower gift for friends or family! 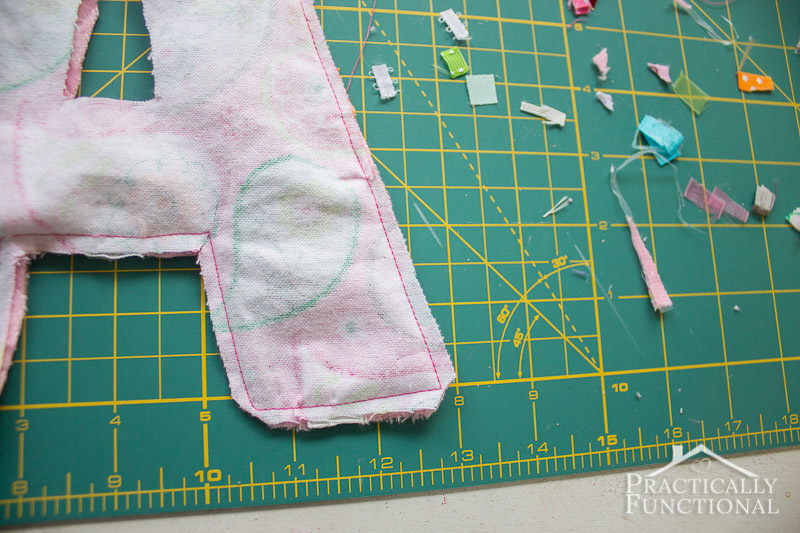 You do need a sewing machine (unless you don’t mind doing a ton of sewing by hand) but it’s not at all complicated, so don’t worry! pins, scissors, sewing machine, etc. The first thing I did was to print out a giant “A” on a piece of paper to use as a template for the tag toy. I cut the “A” out of the paper and then pinned it to the minky fabric. If you’re making a symmetrical letter like A, M, W, O, etc. then it doesn’t matter which side of the fabric you pin the letter to. 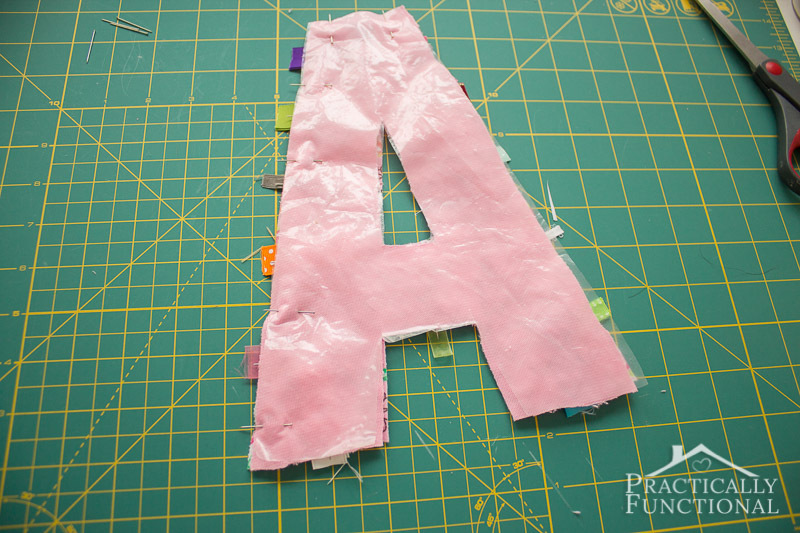 But if you’re making a letter like B or C that has a specific direction to it, make sure you pin the paper letter to the front side of the fabric before you cut it out; otherwise it will be backwards! 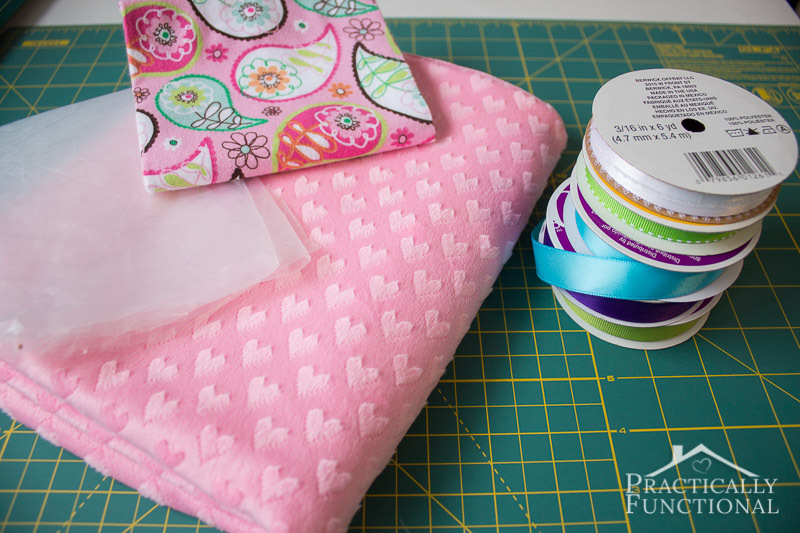 Cut the letter out of your fabric, then repeat with the fabric you’re using for the other side. Next, cut the letter out of your crinkle material. I used an empty cereal bag and it works great! Once you finish the cereal, dump the crumbs out of the bag. Then cut the bottom off of the bag, and cut open the bag at the seam. Rinse the bag and sponge it off with soap and water, then set it aside to dry. 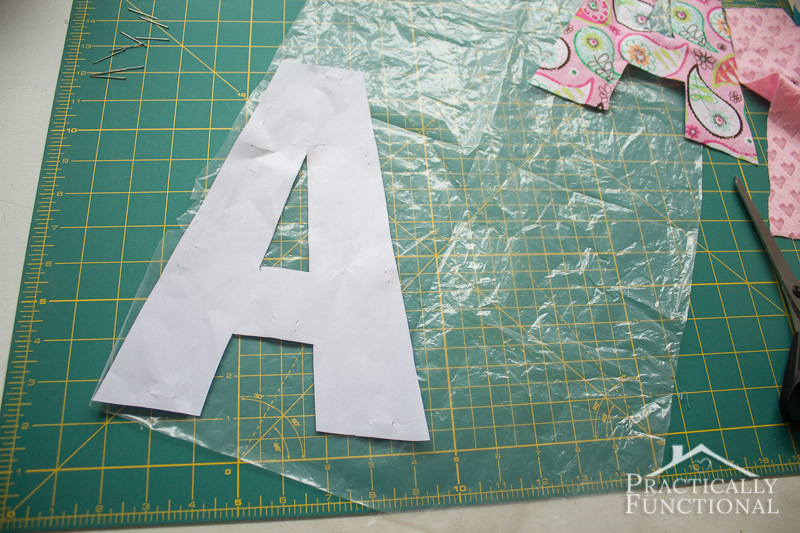 Once it’s dry, pin the paper letter to the cereal bag and cut out the letter just like with the fabric! Now it’s time to add the tags! 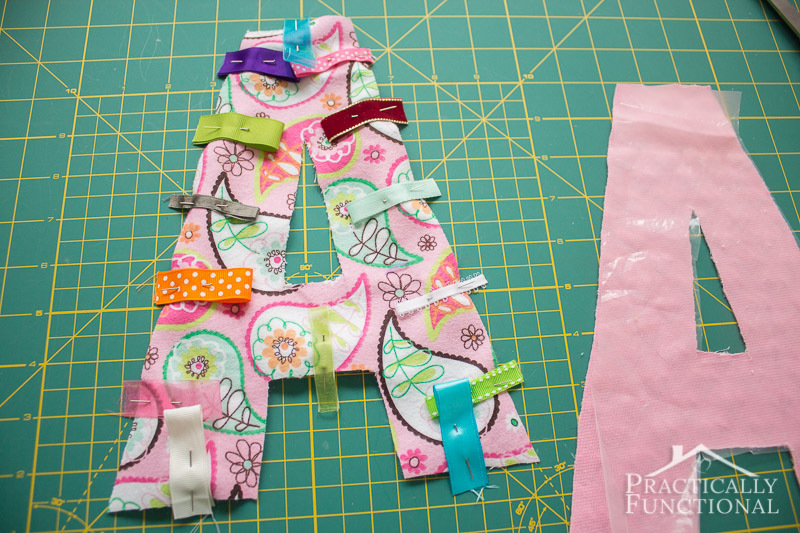 Cut a 4” piece of ribbon, fold it in half, and pin it to the right side of one of your fabric letters. 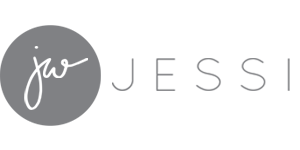 Make sure the folded part of the ribbon is towards the middle of the letter, and line up the edges of the ribbon with the edge of the letter, or let the ribbon slightly overhang the edge. Continue cutting 4” pieces of ribbon, folding them, and pinning them to your letter until you have enough tags; it can be however many you want! Lay your other fabric letter on top of the ribbons, right side facing down, then lay the cereal bag letter on top of that. Pin all three layers together. 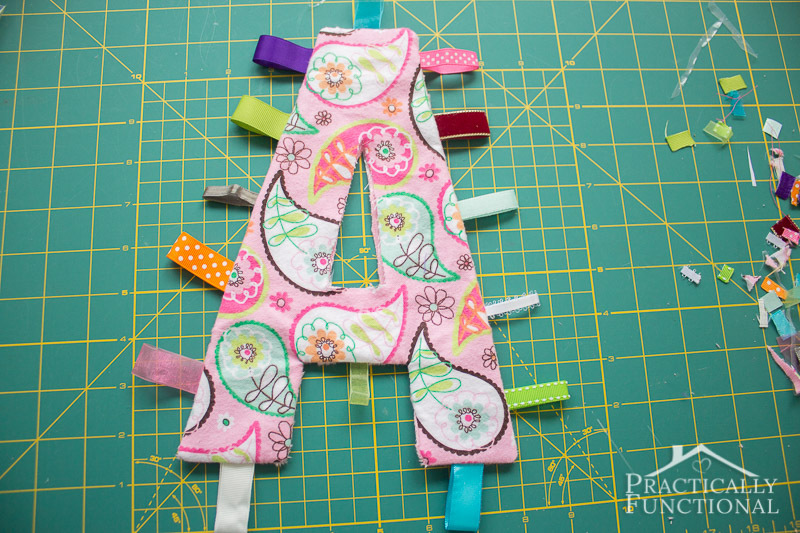 Once everything is pinned together, sew around the outside of the letter leaving an 1/8” seam. For letters like C, F, H, etc. that don’t have a “hole” in the middle of them, sew around the outside edge, leaving a 2″ hole for turning. 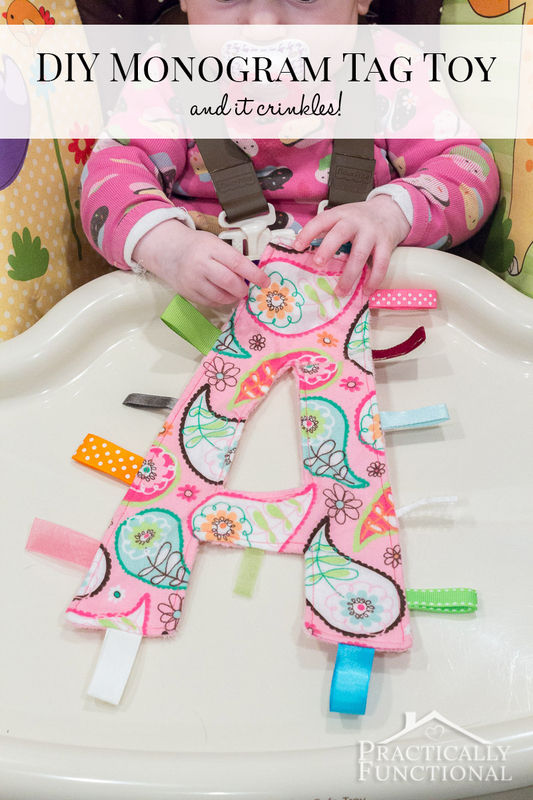 For any letter with a hole in the center of it, like A, B, D, O, etc., you can just sew around the entire outer edge; don’t worry about leaving a hole for turning. 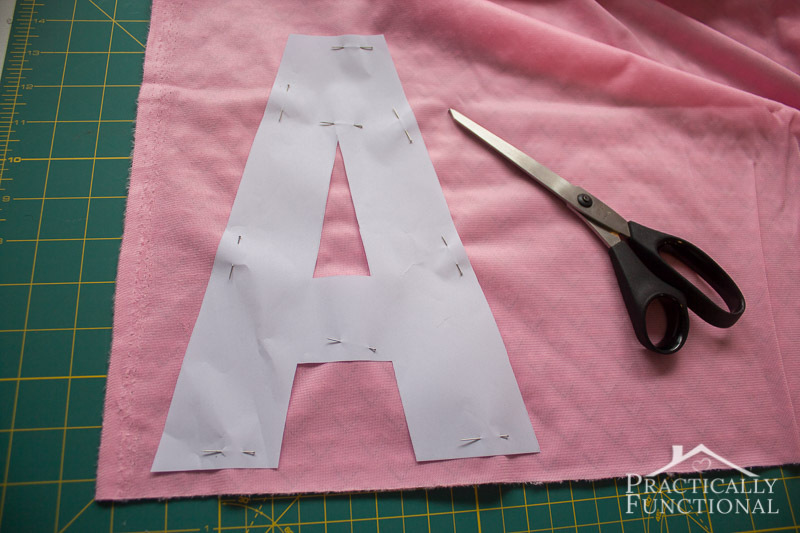 But make sure you don’t sew around the hole in the middle of the letter; only sew around the outer edge. Then remove the pins, clip the corners of your letter, and trim all of the ends of the ribbons. Once you’ve clipped the corners, turn the letter right side out, making sure that your cereal bag is between the other two fabric layers. If your letter has a hole in the center, use that hole to turn the letter inside out. Otherwise use the 2” hole you left in the outer edge of the letter. Top stitch around the outer edge of the letter. If your letter doesn’t have a hole in the center, you’re done! If your letter has a hole in the center, you have two options for finishing the hole. 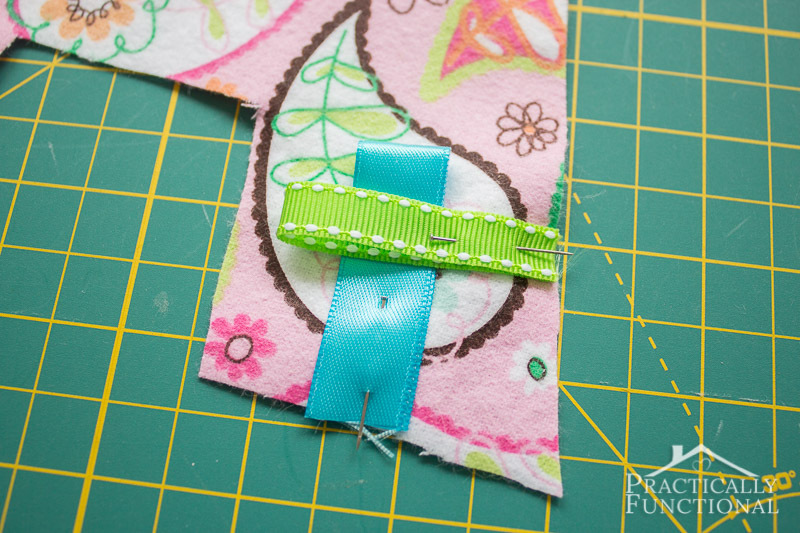 You can top stitch around the edges of the hole, then use pinking shears to clip the edges so they don’t fray. Or you can do it like I did and turn the fabric under around the edges of the hole before topstitching. 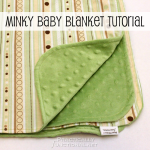 It’s a little more difficult to turn the edges under and stitch them, but it gives a cleaner look and you don’t need to worry about the edges fraying. But either way will work! After you’ve topstitched all the edges, you’re done! 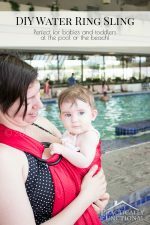 Hand it to your baby and let them enjoy! 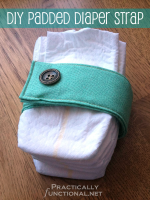 Or wrap it up as a baby shower gift! That is adorable and so is she!!! What a smart idea! 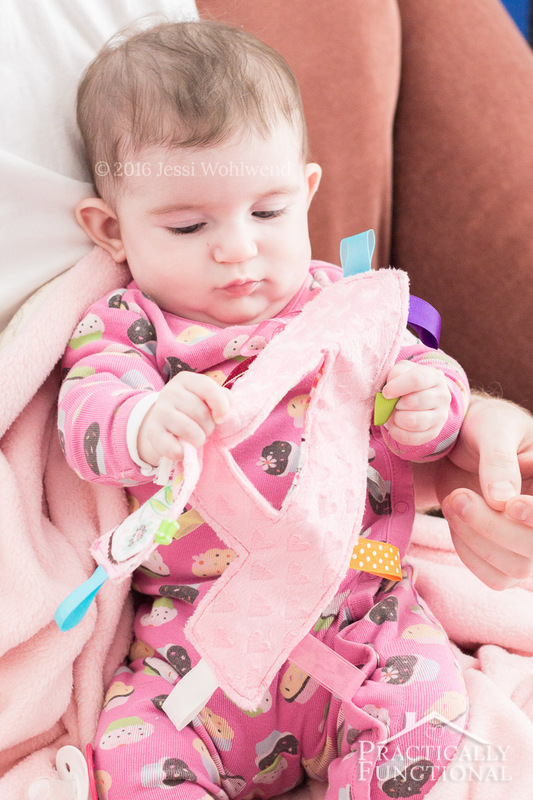 My nephew loves crinkly toys- and all babies love tags. It really turned out great. Does AJ just love it? I just attempted this crinkle project and it is cute. My problem was that I didn’t realize how large to make it and made mine too small. I started with an 8.5×11 inch letter. What size should I use and where do I find such a large letter? How do I print it, etc.? That’s got me stuck. I hope to do this again; much larger. What size template was used in the picture to make that size? I made an 8.5×11 inch letter too. I just typed an “A” into a Word doc, then made it as big as I could before it went onto two pages. Then I printed it and used that as the template. 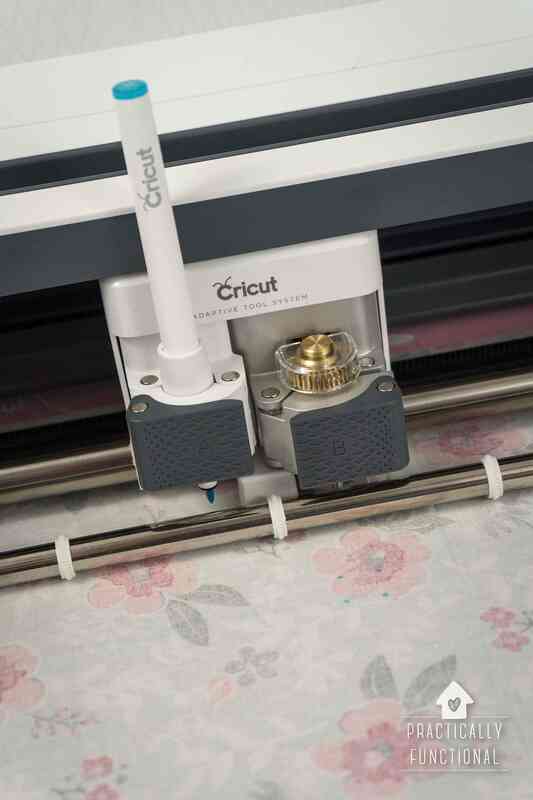 If you want to do something larger than a single sheet of paper you can try making Word print out the letter as an image so it spans multiple pages, then you can cut it out and tape them together to make a larger template. Yep! Just be careful drying it (tumble dry no heat, or hang to dry) because the plastic that makes the crinkly sound could melt in the dryer.